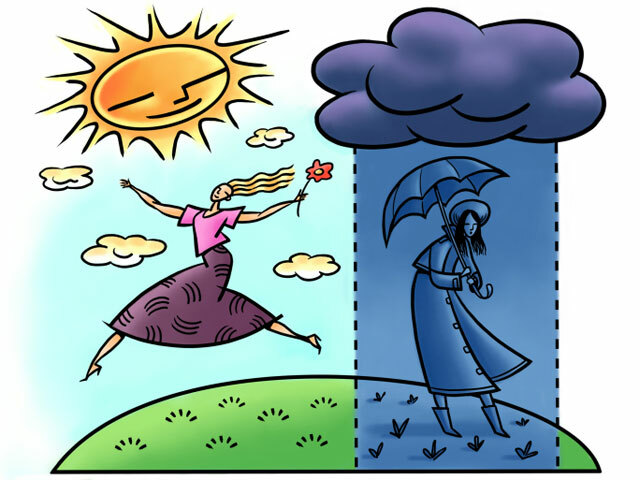 Does Weather Effect Your Mood? Whenever I look outside my window and it’s dark and rainy I always find myself wanting to curl up in my bed and have a Netflix marathon. The dreary weather always makes me feel dreary and lazy. I wanted to know if I was just like this when it was rainy by chance, or by some confounding variable, or if there was a real connection between the weather and my mood. First I established the null hypothesis: Weather and mood are not connected in any way. 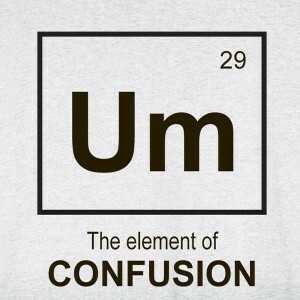 This is the hypothesis that we are looking to reject, we want to see that something is in fact going on. It seems to be common sense that when it’s sunny and warm you are happy and joyful, and when its dark and gloomy you are sad and tired, it’s just a common association. However, researchers are slow to accept this theory. In one study they took around 1,000 people and had them report their daily well-being, and then lined their testimony up with the weather report. Overall they found that th ere was very little variance in their subject’s day-to-day mood that was dependent on the weather. What the research did show however was that there is a significant association between tiredness and sunlight. The less sunlight that people were exposed to, the more fatigued they felt. This could be because of the hormone melatonin. Less sunlight causes you brain to produce more melatonin, which makes you feel drowsy. This is just a small thing though and has little to do with a real substantial change in mood. Sunlight can also trigger the production of a hormone called serotonin which helps your body maintain mood balance. 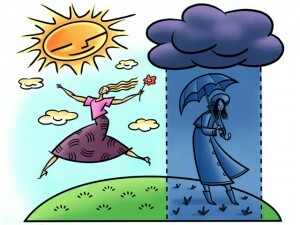 A lack of sunlight can lead to a reduction of serotonin which in turn can lead to feelings of sadness and depression. A lot of the articles that I read did however mention seasonal affective disorder (SAD). SAD is a type of depression that comes and goes in a seasonal pattern. It is sometimes known as winter depression because the symptoms are most apparent and usually most severe during the winter months. Doctors have yet to find the exact cause of SAD, but it’s symptoms are often linked to the reduced exposure to sunlight and the overproduction of melatonin that I talked about earlier. So my conclusion is while in extreme cases like diagnosis of SAD, weather can have a large effect on the mood. For the average person, a rainy day isn’t going to make you any sadder or more tired or happier than a sunny one. So next time you’re feeling tired or lazy try not to blame it on the weather, because there could be something else going on. This entry was posted in Uncategorized on October 21, 2016 by Randall Stansbury. Do Violent Video Games Cause Aggressive Behavior in Their Players? It is a common argument nowadays that violent video games are causing violence and behavior problems in today’s youth. The average adolescent is exposed to enormous amounts of violence through the media. American children between eight and eighteen years of age spend an average seven hours and thirty minutes using entertainment media per day. This amount of time is longer than the average high school, middle school, and elementary school day. Within that seven hours of media exposure, there are extreme amounts of violence viewed. By the age of eighteen, the average young person will have watched around 200,000 acts of violence on television alone. This amount of exposure to violent media, which can include television, internet, movies, music, and video games, can have drastic effects on the way adolescents think and feel. I feel like with all this exposure there has to be a connection between the violence that these kids see in the video games and their aggressive tendencies. The hypothesis that I was researching is the idea that the violent video games cause aggressive tendencies in adolescents. The null hypothesis would of course be that nothing is happening, and there is no connection between the two variables. An article released by Harvard Medical School states that there are two sides of the debate. There are the people who believe that exposure to violent media can help contribute to real-life violence and harmful behavior, other researchers have questions the validity of much of this evidence. For starters, much of the research relies on measures assessing violence that don’t correlate with real-life violence. They also talk about how many of the studies done our observational, which aren’t the best when trying to prove a cause-effect relationship. They also note that crime stats involving serious and violent crimes among youth have continued to lower over the years, and in that time video game sales have skyrocketed. Another article mentions a meta-analysis done for many research papers concerning aggression and the media. 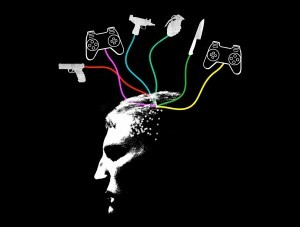 This analysis found that while there is a solid relationship between an increase in aggressive behavior and the playing and viewing of violent video games there were also several third variables that came into play. The kids that really acted on these aggressive feelings were ones who already had antisocial behavioral tendencies, depression, trouble at home, academic problems, etc. Video games are less of a single casual variable, and more of one of many variables that feed into violent people and their actions. I think that it is safe to say that we can reject the null hypothesis, as the meta-analysis did show that there is some correlation between violent video games and the aggressive tendencies of their audiences. However, I think that it is extremely important to keep all the other variables in mind, and remember that video games on their own are not the culprit. Does Beer Before Liquor Really Make You Sicker? “Beer before liquor makes you sicker, liquor before beer and you’re in the clear” was a saying that was hammered into my mind by my friend’s older sister before I was old enough to even think about any type of alcoholic beverage. Now it has become a sort of fact that has always been stuck in my brain, but I wanted to know if there was any truth to the saying that seemed so wise in my little brain so many years ago. First I wanted to establish a null hypothesis. The null hypothesis means that you administer the research and you discover that nothing is going on. In this scenario the null hypothesis would show that beer before liquor has no effect on making you sicker than if you just drank one, or if you drank the liquor before the beer. If the research shows that something is in fact going on, then they are able to reject the null hypothesis. Obviously that is the goal, because scientists rarely want to investigate an instance where nothing is going on. 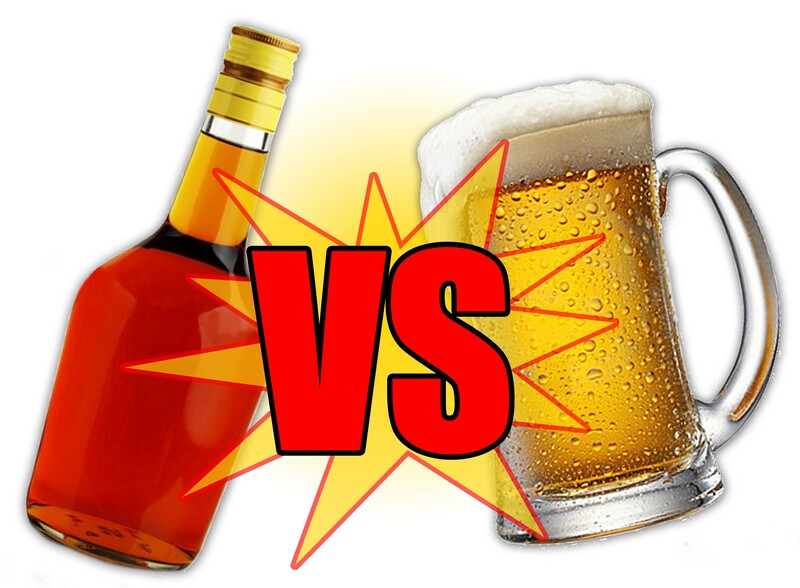 People tend to think that you can drink beer after drinking hard alcohol with less consequences because beer has less alcohol content. I read one account from someone named Kyle Brubaker, but it seemed to be a more anecdotal piece of data. Brubaker talks about how your liver can process approximately one drink an hour, and any extra alcohol flows through your blood freely. When you drink more than one shot, your liver is hit harder than if you were to have a couple beers, and so It takes longer for your liver to detox that alcohol. However, Brubaker starts his claim with words like personally, which make it seem like his data may not be completely accurate. The experts seem to have a different opinion than Brubaker. Dr. Keri Peterson attempts to debunk this myth in this article. Dr. Peterson explains that the order is less important than the total amount of alcohol you drink. If you drink ten shots in one night, it isn’t going to matter if you took the shots before you drink the beer, you’re going to be sick no matter what. She also adds that alcohol lowers your inhibitions, which can cause you to drink more. If you start with the liquor, which has a higher percentage of alcohol, your inhibition is going to lower faster and you may find yourself drinking more. While you may find Dr. Peterson’s facts convincing, it is hard to come to a solid conclusion to our hypothesis without any solid data. From what I have read, it would seem to me that the null hypothesis is correct, and that become ill from drinking has very little to do with the order in which you drink your beverages. However, if you want to continue to say the rhyme and drink that way, there isn’t a lot of hard evidence or threat of harm there to stop you. 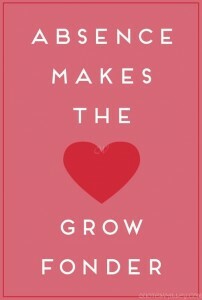 I’m sure that everyone knows the phrase “absence makes the heart grow fonder”. Coming to college I’m sure ev eryone also knows someone who is in a long distance relationship. Now from witnessing multiple long distance relationships, some end up well, but some could be described by words that are far from “fond”. I decided to look into if there was any truth to this old-fashioned saying. Personally I think that relationships are hard to judge because each one is unique and different, so I feel that I would lean toward the null hypothesis in this situation. The null hypothesis is that nothing is going on, so absence would have no effect on fondness. The study that I focused on was mentioned in this article. The study gathered information from surveys regarding the quality and quantity of the communication they had with their significant other. The results showed that these long distance relationships were actually quite stable and loving compared to the ones where the couple resided in the same place. The researchers attributed a good amount of this to huge changes in the way that we use technology. Years ago these studies may have prompted a very different result because people then did not have the means of communication that we have now. In the survey, most couples shared that they usually have constant communication through text, Snapchat, FaceTime, etc. This ends up feeling a lot less like “absence” then it may have a while back. I think that this brings up a really interesting point about how science has to change with society’s changes. If you had seen this study a few years ago, it could have found such a different answer than the one that these researchers have found today. This is the importance of making sure that science always keeps checking itself and why things have to be looked at repeatedly. The researchers found that not only did the couples who were long distance increase the frequency of their communication and the channels of their communication, they also changed the seriousness and intensity of the topics they talked about. This leads to a heightened amount of psychological intimacy, in the place of a lacking physical intimacy. 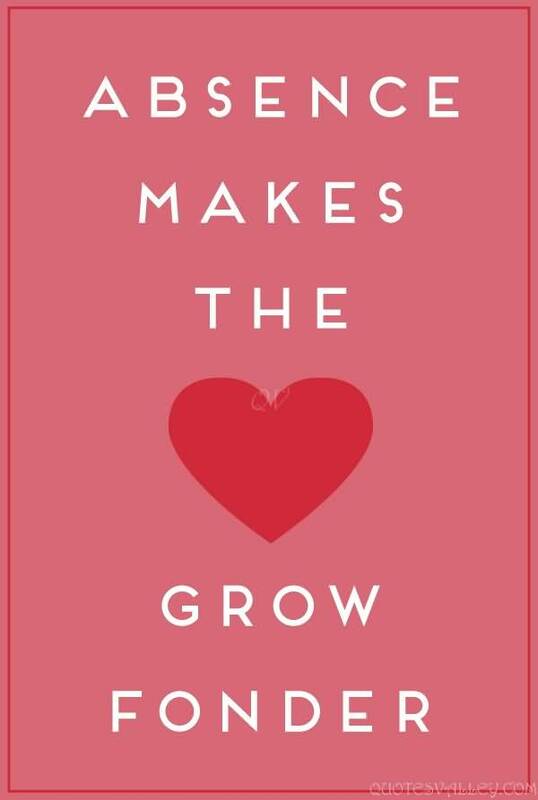 While this latest study is certainly heartening and gives hope to many couples who are trying the whole long distance thing, this study can and has been contested by others. One study even goes as far to say that relationships REQUIRE regular face-to-face contact in order to succeed. One thing that stood out to me in the study that gathered their data through survey and saw that distance was actually beneficial for the relationship was that it was only a study of sixty-three couples. I think that in order to get a more solid answer to this question it would be vital to involve more couples in the study. So I guess there is no clear conclusion to this question but if you want to look on the bright side there are plenty of researchers and couples who will agree with you, and if you’re a little bitter about how your long distance relationship ended, there’s claims to back that up too. This entry was posted in Uncategorized on October 20, 2016 by Randall Stansbury. “Oh my god you look so tan!! !” I exclaimed to my friend when she walked up to lacrosse practice one afternoon in May. For some reason being tan has somehow been associated with looking pretty or healthy or good. My pale friends would pout and whine about their skin tone in the winter, or how they burn in the summer and don’t even end up tan (being half black I’ve never really felt this pain but I have been around enough complaints). So what is their genius solution to this problem? Tanning beds of course. When I first heard that my friends went to tanning beds I was absolutely horrified. 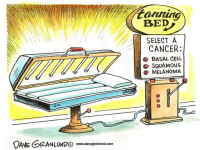 To me tanning beds and skin cancer go together just like smoking and lung cancer do. My friends insisted that it was fine, nothing was going to happen to them, and that I was overreacting. Plus, I had told them they looked great!!! So why should they stop? I decided to look into it, and see how strong the connection between tanning beds and skin cancer really is. A number of conclusions could be drawn by looking at this data. The null hypothesis would be that nothing is going on, meaning that tanning beds have absolutely no effect on your chances of getting skin cancer in the future. However, my hypothesis is that something IS happening: The tanning bed is causing the skin cancer. Obviously this is a hot topic, especially among young people, so there have been an amount of studies on this. I think that the most successful studies they could do would be a study modeled after the longitudinal smoking lung cancer study: They ask young people if they used tanning beds, and then they would follow these people through their lives and see if they were diagnosed with skin cancer later in life. However, there is also a lot of previous information about this issue, so meta-analysis of existing data is also a great way to gather information as stated by epidemiologists Swerdlow and Weinstock here. When looking at studies I also realized that there were a lot of variables that could vary from person to person which would therefore effect the results. Some of the variables that this article mentioned included the wavelengths of UV rays that were emitted over time, the dosage received, and the characteristics of the people in the study (people with light hair, eyes and skin burn more easily and are most at risk). The Skin Cancer Foundation conducted a meta-analysis which included 88 studies, 406,696 participants, and three geographic regions that showed that the number of skin cancer cases due to tanning is HIGHER than the number of lung cancer cases due to smoking each year. I think that the most mind-blowing thing about these results is that all of this could be avoided!!!!! Smoking is a little harder because you can get addicted to nicotine and actually feel the need to smoke, but tanning is literally just a beauty thing!! I think that it is so ridiculous that someone would but themselves at such a high risk of cancer just to look a little darker. The good news is that there continues to be a lot more education about the dangers of tanning and legislation (http://www.ncsl.org/research/health/indoor-tanning-restrictions.aspx) is even being passed. These are the first steps to protect young people from the dangers of tanning. Can Our Dogs Understand Us? “Sit Rosco!!!!!! Sit!!! Rosco down!! Sit! !” Everyday I would scream at my puppy as he ran in circles barking and jumping up and down at our mailman. I couldn’t help but think, is he ignoring me?? Does he hear me and just think that our mailman is more important??? Or can he really just not understand a word I am saying. I always doubted this, because when it was just us without the mailman, my dog would sit and stay and come and go just as I asked, but I wanted to investigate this further. While your dog probably doesn’t understand if you ask them to “Please go over there and sit down for a little bit”, studies show that on average a dog can understand around 165 words. One article talked about how dogs learn words easiest when they are attached to an action. For example, if you ask your dog if they want FOOD every time you go to feed them, soon enough the dog will associate the word FOOD with what they are eating. Another article led me to a study that investigated how dogs process language. 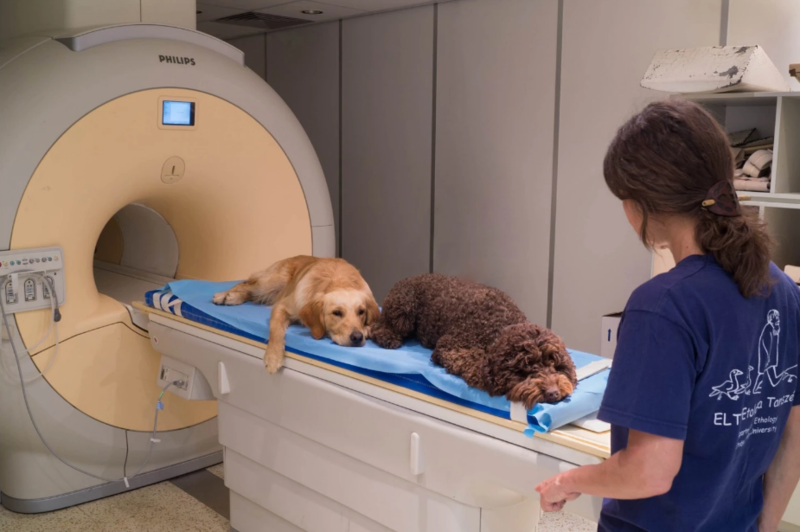 The study scanned the brains of the dogs and found that like humans, dogs use the left side of their brain to process words and the right side to process the emotion behind the words (https://www.washingtonpost.com/news/animalia/wp/2016/08/30/confirmed-your-dog-really-does-get-you/ ). These two processes then come together to combine the word itself with the way in which it is said to come to a conclusion about what their owner is trying to say. This study proves that dogs hear most words, even ones that are not important to them, in the human language, and then are able to decipher which ones they should listen and respond to. The article also talked about the tone of voice you use on your dog, and remarked that while tone matters, the dog responds best when the tone that you are speaking in matches the words that you are saying. For example, my dog hates the bath. And even if we sing a happy song about the bath, and sound really excited about the bath, chances are my dog is still gonna know that we are trying to give him a bath and try and run in the opposite direction. I always think that it is interesting to find out that animals really aren’t that different from us, especially ones that we keep as pets. It kind of shocked me that our dogs really do understand a lot of what we are saying, and process it just like we do. Our pets are more like us than we probably could ever imagine. This entry was posted in Uncategorized on September 16, 2016 by Randall Stansbury. Does Sleep Deprivation Cause Weight Gain? The dreaded Freshmen 15 is something that I think is on a majority of people’s minds as they prepare for college. But why is the Freshmen 15 a thing? Is it the all you can eat buffets at the dining hall? The ramen you have stashed in your dorm room? 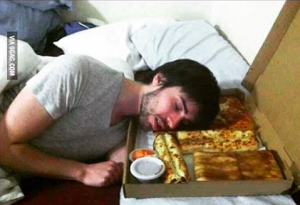 Or is it all that pizza that you eat at one o’clock in the morning on a Saturday? While trying to figure out what lifestyle changes could factor in to me gaining the weight. I noticed that one of the biggest things that I have had to deal with as I adjust to college life is the drop in the amount of sleep that I have been getting. Even though my earliest class starts at ten o’clock in the morning, a good two hours later than my high school classes started, I have been going to bed much, much later than in high school. I was wondering if this change could contribute to gaining weight in college. The one thing that I discovered was that though many people agree that lack of sleep can attribute to weight gain, there is disagreement about the mechanism behind this correlation. One article talked about two observational studies. One focused on men who suffered from recurrent sleep deprivation. The less that these men slept, the more they craved high-calorie foods and the more calories they consumed in general. The second study focused on women. The women who recorded that they slept for less than six hours a night were more likely to gain weight than women who slept seven or more hours a night. The article mentioned that there have been studies done with children and adolescents that have elicited similar results. The mechanism that this particular article gave had to do with the hormones that control hunger. The amount of time that someone sleeps can affect their levels of ghrelin and leptin. Leptin is a hormone that tells the brain that your body has had enough food. Ghrelin is a hormone that tells your brain that you are hungry. If these hormones are affected, it can change how often and how much you eat. Another article made the same claim that sleep deprivation can lead to weight gain, but they put the blame on a completely different hormone entirely. This article introduces cortisol, which is a stress hormone that makes you hungry. This suggests that when you sleep less, your cortisol levels rise, and you’re going to eat more. The article also talks about how sleep deprivation can stop your body from successfully digesting sugars. Lack of sleep can also cause your body to go into survival mode. Your body wants as much fuel as possible, and it wants to keep all available resources so your metabolism slows down. The third article that I looked at talked about how your lack of sleep could impact your decision-making, making you not want to say no to that late night pizza. Even though the evidence is shaky, all of these claims made me think about the amount of sleep that I’m getting, and how it could be affecting my health. My mom drinks around three 8 ounce cups of coffee a day. She gets pounding headaches when she doesn’t get her coffee, which leads her to crabby and short-tempered. When I was in middle school I used to get so annoyed that this happened. I didn’t understand how her mood could be so dependent on a stupid drink. Fast forward to the end of my senior year and if I hadn’t had my third cup of coffee by the end of second period there was no way you would even want to look in my direction. I, like my mom, would get a debilitating headache that caused me to be irritable and cranky. I couldn’t believe that I had gotten to this level of caffeine dependency when merely four years ago I was whining about the fact that a) My mother was like this and b) How disgusting coffee tasted. On a side not I still don’t love the taste but now that I’m hooked it doesn’t matter and more often than not I drink my coffee black. As I was staring sadly at my empty cup of coffee the other morning, I got a text from my mom. She was upset because her Keurig machine had broken at work and she had a big meeting that she could not go into without coffee. I began to wonder if there was a connection between me and my mom’s similar relationships with coffee. After some research I found that there have been some discoveries that link caffeine addiction to genetics. A gene, called PDSS2, was found in a study investigating the link between caffeine consumption and genetics. The gene was found using a genome-wide association study. More can be found about how genome-wide association studies work here, but it’s basically when you scan the genomes or DNA of a large sample of people to see if there are certain variations of genes that are connected to particular habits or diseases. When I first started reading about the gene I was expecting it to be the kind of thing where it made you think that coffee tasted good, or people with this gene were extra tired so they need more caffeine than your average person. In reality the gene is thought to control how your body metabolizes caffeine. The study found that the people who reported drinking less coffee were also those whose DNA came up in the association study with the markers of the PDSS2 gene. This led the researchers to believe that the gene may have an effect on the speed of which your body produces the proteins that metabolize the caffeine in your coffee. The study author, Nina Pirastu, stated her official hypothesis that “people with higher levels of this gene are metabolizing caffeine slower, and that’s why they’re drinking less coffee, they need to drink it less often to still have the positive effects of caffeine, like being awake and feeling less tired” (http://time.com/4464843/genetics-coffee-consumption-caffeine/). 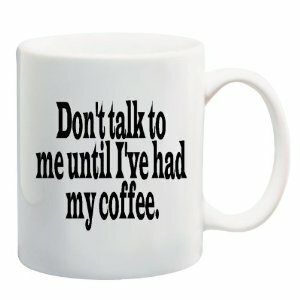 Basically the study is attempting to prove that you don’t drink more coffee because you get more tired than other people, or you like the taste more, or you watched your mom drink a lot of coffee so you mirror her behavior, it is because your body physically needs less caffeine to feel more energized throughout the day. I guess I will never know if I get my three cup a day habit from my mom, from random chance, or because I like the routine in the morning, but this study gave me good insight into what could be a possible reason for my addiction. Who knows maybe one day I can get my genes scanned for PDSS2 and know for sure. This entry was posted in Uncategorized on September 15, 2016 by Randall Stansbury. Hi everyone!! My name is Randall Stansbury and I am from Arlington, Massachusetts, a small town just outside of Boston (I have yet to meet a single person from Massachusetts since I’ve been here). I’m in the college of communications, hoping to major in Public Relations or Advertising. I played a bunch of sports in high school, lacrosse being my favorite, but I plan on just staying active and doing intramural sports in college. I put this class on my schedule without knowing much about it, but I needed a science class and my advisor suggested it. I don’t have any high school science horror story. I had decent teachers and got decent grades but nothing that really caught my interest. For me, memorizing equations and definitions is easy but understanding what I was memorizing was a little harder. Especially when it came to chemistry and biology, I would have all these definitions in my head, and no idea how to put them into practice. It was hard to study something that I didn’t really have any understanding of. Senior year of high school I took archeology as my science and it was a complete joke. We would go outside to the front lawn of my high school everyday, and dig holes in the grass. I don’t know what my teacher expected us to find, but all my group found was a crushed up beer can about five inches down. Not only was it kind of pointless, but my high school’s lawn ended up looking something like this. I am really excited for this course because it seems to be more about the real interesting questions of science that make you think, and not just about digging holes in the ground. This entry was posted in Uncategorized on August 30, 2016 by Randall Stansbury.